The Whynter Built-In Undercounter Wine Refrigerator offers premium quality and innovative design ideal for your wine collecting needs. Whether for the enthusiast or the connoisseur, the Whynter built-in undercounter wine refrigerator provides affordable yet advanced wine storage functionality. This Whynter single zone wine storage system (BWR-18SD) can hold up to 19 standard 750 ml wine bottles. The powerful compressor cooling system offers optimum temperature for red, white and sparkling wines. The front ventilation design of this unit allows for flush with cabinet undercounter installation or simply freestanding usage. The premium appeal of the BWR-18SD features an exclusive stainless steel trimmed door and a heavy stainless steel L-bar handle. The six removable scalloped chrome racks in the unit allow for maximum storage capacity. 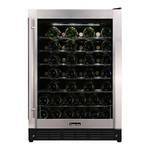 With its stainless steel door frame and tempered smoked glass door, the spacious Magic Chef 50-Bottle Wine Cooler provides a stylish, effective method for keeping your favorite wines at an ideal temperature. The 5 removable chrome shelves and one rack keep your wine collection organized and easily accessed. The tempered, smoked glass door and stainless steel frame and handle offer durability and an attractive look. 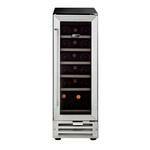 The wine cooler can be built-in or left freestanding to suit your needs. Expand your storage solutions with this Seward Trailblazer Footlocker Trunk with Wheels. Durable wooden construction and heavy gauge vinyl covering make this trunk a reliable solution for all of your storage and organizational needs. Designed with durability in mind, this Seward Trailblazer Footlocker Trunk is made with tacked fiber binding and nickel plated hardware. It is easy-to-maneuver with 2-convenient leather handles and 2-recessed wheels. Plus, it features an easy open push button key lock (includes 2-keys) and tongue and groove closure. This wooden footlocker is black to match just about any decor.